When flutist Clara Fishlock audi­tioned for the 2018 Concerto/Aria Com­pe­tition, she chan­neled the sound of bow hairs grating on strings rather than the hushed whispers floating from a flute. 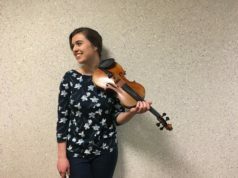 The junior history and French major drew her musical inspi­ration from the violin rather than the flute to pre­serve the heart of the piece, which she will perform on March 1 with the Hillsdale College Sym­phony Orchestra after earning a winning spot in the com­pe­tition. Aram Khacha­turian wrote his “Violin Con­certo in D minor” for the violin, as the song’s title indi­cates. When Fishlock trans­poses the piece to the flute, she strives to keep the musical quality of a vio­linist. Fishlock said she treats notes of shorter lengths, for example, with special care. On the flute, peels of eighth notes and six­teenth notes take on a del­icate tone, but a vio­linist per­forming this piece would grind her bow across the strings to evoke a more pow­erful sound. “I did a lot of lis­tening to violin, and I thought a lot about how to best mimic those sounds on the flute,” Fishlock said. When Fishlock began prac­ticing the con­certo, her ears were already attune to the sounds and tech­niques of the violin: Her sister, freshman Eleanor Fishlock, has played the violin since she was a little girl. A member of the orchestra, Eleanor will sit among the string section in March and accompany her older sister as she per­forms her solo. The sisters are not the only members of the Fishlock family who possess musical talent. David Fishlock, their father, is the prin­cipal per­cus­sionist in the Cincinnati Sym­phony Orchestra. After winning a con­certo com­pe­tition in high school, Clara Fishlock played Franz Doppler’s “Fan­taisie Pas­torale Hon­groise” with the Cincinnati Sym­phony Youth Orchestra at the same concert as the Cincinnati Sym­phony Orchestra, taking the stage with her father. Clara Fishlock said com­pe­ti­tions like the CSYO Con­certo Com­pe­tition pre­pared her for her January audition. 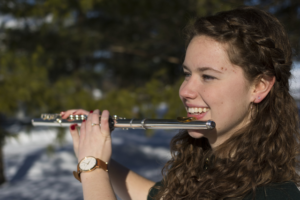 And Fishlock’s flute teacher at Hillsdale, Adjunct Instructor Jaimie Wagner, said her student entered the college’s music program as an advanced musician. “Clara was a great flutist when she arrived at Hillsdale, with excellent tech­nical faculty and a beau­tiful lyrical style,” Wagner said. 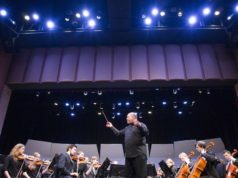 Orchestra Director James Holleman echoed Wagner’s obser­vation and said Fishlock is a leader of the orchestra, always mod­eling pre­paredness and atten­tiveness in rehearsals. Though he did not par­tic­ipate with the con­certo competition’s judges in picking a winner, Holleman said Fishlock’s per­for­mance impressed him. Wagner said the concerto’s dif­fi­culty lies in the fact that it was written for another instrument. Pri­marily, the piece presents no oppor­tu­nities for a flutist to breathe, since it was orig­i­nally com­posed for a string player who can breathe at any point in the music. Fishlock added that, dis­re­garding its demanding pas­sages, the piece exhausts her just in its length. Despite the demands of the music, Fishlock said she’s happy with the com­pet­itive atmos­phere at the music department. Senior Katherine Scheu is the associate editor and graphic designer of The Hillsdale Collegian. When she finishes her time studying French and journalism at Hillsdale, she plans to move to Washington, D.C., and pursue a career in reporting and writing.